This interview is with Bill Van Lopik, who, along with his wife, spent years doing justice work in El Salvador while calling Grand Rapids home. Bill is one of the hundreds of people from Grand Rapids who were part of the Central American Solidarity movement in the 1980s and 90s. GRPH – When did you first get involved in Central American Solidarity work and what influenced you to do so? Bill – My involvement in the Central American Solidarity movement was rather serendipitous and unplanned. My wife and I were hired by the Christian Reformed World Relief Committee (CRWRC) in 1985 as community development interns in Costa Rica. We were naïve and uninformed about what was transpiring in Central America other than knowing that there was lots of civil strife going on in every country in the region outside of Costa Rica. We had no idea the extent in which our own country was fomenting and funding these internal wars in Nicaragua, Guatemala and El Salvador. 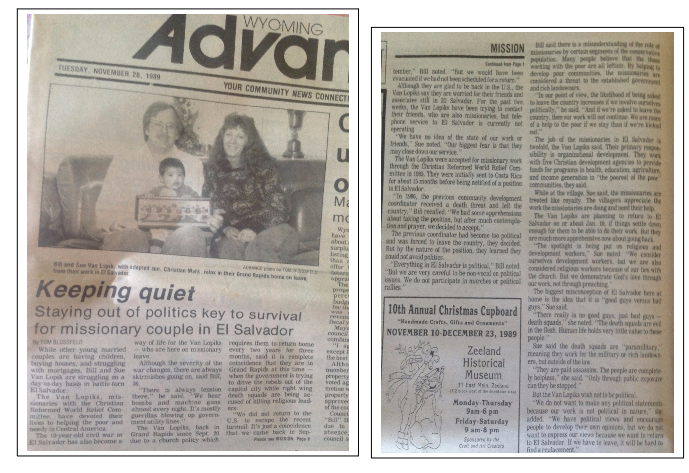 Our perspective and awareness radically changed in 1986 when a staff position with CRWRC opened up in El Salvador because of death threats against a former staff member. After much discernment we decided to accept the job knowing full well the risks that could be involved in moving to such a volatile situation. We started reading as many books as we could get to try to comprehend the basis of the conflict beyond the Cold War rhetoric that was consistently espoused on US network TV. One book that was particularly stirring to me was “Weakness and Deceit” by Ray Bonner. In it he explained how the war was actually based on a gross inequitable distribution of land in the country where the landed elite were oppressing anyone who called for land reform and a more just society. It did not take long after arriving in the country that I could confirm what Bonner was writing about. We did not show up in El Salvador as participants or even as knowledgeable bystanders of the Central American Solidarity network. Our orientation came from traveling to every department of the country, accompanying our Salvadoran development partners to remote villages as we passed by suspicious military convoys. 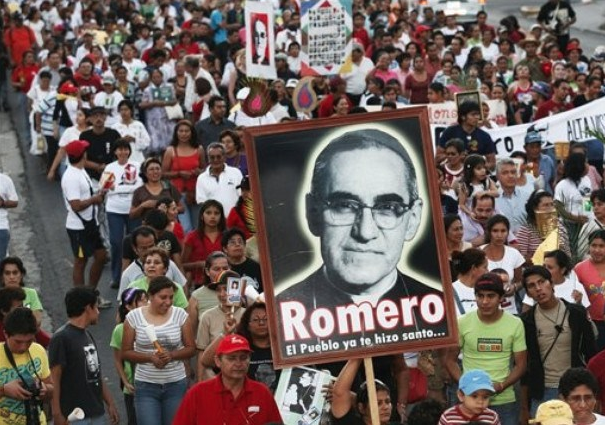 We learned solidarity from those who thanked us for staying in the country when other North Americans had left, and we learned it from people like Archbishop Oscar Romero and the other slain priests who continued to call for peace justice in the country at the expense of their own lives. This was our orientation to solidarity in Central America. GRPH – You spent quite a bit of time living and working in El Salvador. How did that experience influence a) how you saw US foreign policy; b) how you understood what it means to be in solidarity with oppressed people? Bill – As I reflect back on what I learned during my experience in El Salvador some 25 years ago the following are the most salient things are learned and I believe still are true today. The majority of the US populace believed that the war was about fighting communist insurgents that were coming over from Cuba and the Soviet Union. This belief was based upon on a sophisticated indoctrination campaign espoused by the Reagan administration. However, the truth was that it was a rural peasant revolt against the rich, landed elite. 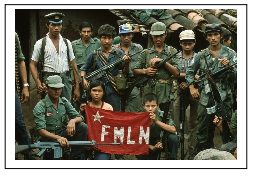 I do not deny that this revolution had outside supporters but it was not the intention of the FMLN to establish a Soviet style government in El Salvador. They wanted land reform more than anything else. I believe that the US leaders knew this but feared that they might not be able to control and coerce a new revolutionary government as they were able to control the established aristocracy. This is why they continued to support the Salvadoran government no matter how brutal and corrupt it was. Over time low intensity warfare can start to feel “normal.” Much of the fighting, torture and misery of the war was occurring in the countryside, far away from urban areas. People in the cities were fooled to think that things in the country are relatively OK outside of an occasional electric or water outage due to the bombing of a rural utility line. This prolonged type of warfare is insidious because it is done in the darkness of nightfall, in fringe areas, to people who are invisible and difficult to account for, and away from any credible documentation. To equate democracy to voting is a complete farce. The Salvadoran government (and US government) was also touting El Salvador as a bastion of democracy because elections took place on a regular basis. Salvadoran elections however were so filled with fraud, manipulation and corruption that there is no way that anyone could classify them as indications of a vibrant democracy. Mainstream media cannot be taken as the source of truth. We would consistently witness an event in the country that would be distorted and politically molded once we saw it on either the Salvadoran TV or even US TV stations. War is a profit making venture for many people. The US was pumping about $1 million a day to fund the war in El Salvador for about 10 years. Much of that money went to pad the pockets of the military elite in the country. While the war was going on, generals, majors and colonels were constructing multi-million dollar mansions located on the hills overlooking San Salvador. Military brass became the new elite of the country replacing the old landed-elite that the revolution was originally started against. The American public was very much ignorant to what was occurring in El Salvador or Central America in general. Most people had no idea where to locate El Salvador on a map, they only knew that there was fighting there and the communists were trying to take over. Whenever we spoke in churches throughout the West Michigan and explained the complexity of the situation in El Salvador there would inevitably arise a question from the audience that would seemingly undermine whatever explanation that I could offer about the situation and that question was “well, what side are we on.” I unfortunately knew that the “we” they were referring to was the United States government official stance and not my own personal stance. With the assumption that whatever side the US government was on, that was the right and only side to be on as an American. GRPH – When coming back to West Michigan after being in Central America, did you speak or write about your experiences? If so, talk about what that looked like and how you were able to communicate what you saw/experienced to people in West MI. After returning to the U.S. in 1992 and the Peace Accords were signed I felt a great muzzle lifted from me and I could freely talk about my experiences in El Salvador. I had opportunities to speak at local area colleges, write some articles and talk on public access television. I would subsequently return to El Salvador on a yearly basis for the next 11 years as part of my board duties with CRISPAZ. I found that public interest in El Salvador quickly waned as the perception took over that once Peace Accords were signed, then everything in the country was fine. The reality is that El Salvador continues to suffer from the trauma and after-effects of the war and ongoing US policy (ie immigration, domestic policy supporting the deportation of gang violence, etc.) The number of civilians killed from violence on a daily basis is equivalent to the mortality rates during the war. GRPH – In what ways were you involved in Central American Solidarity work while living in West Michigan? After leaving El Salvador in 1992 I became very involved in organizations and networks that desired to keep the spotlight on Central America even as the international media was turning its’ attention on other hot spots around the world. I became a board member with the organization CRISPAZ (Christians for Peace in El Salvador). This organization arranges delegations from the US to visit El Salvador and learn the reality of the situation there by visiting communities, interviewing local leaders and talking to war survivors. This organization has educated thousands of North American students and church groups on what solidarity with Salvadoran is all about. I served on the board of CRISPAZ for 12 years and was President of the Board for one term. After settling back in West Michigan I felt I needed to be around other like-minded individuals who were knowledgeable, passionate and proactive about continuing to focus on injustices in Central America. I found this support group at the Institute for Global Education where I was able to participate as a board member for a number of years. In 1994 I became acquainted with Frank Girard who was a long-time socialist and activist. I greatly respected Frank and his deep and long-standing conviction to socialist principles in spite of the obvious unpopularity of these views in Grand Rapids. I would regularly attend his SEE meetings (Society for Economic Equality) and appear on his Public Access television program. I felt that I needed to be around people like Frank after our time in El Salvador. In 1996 I was asked by Jeff Smith to help him chaperone a group of Aquinas College students to a demonstration outside the gates of Fort Benning, Georgia. 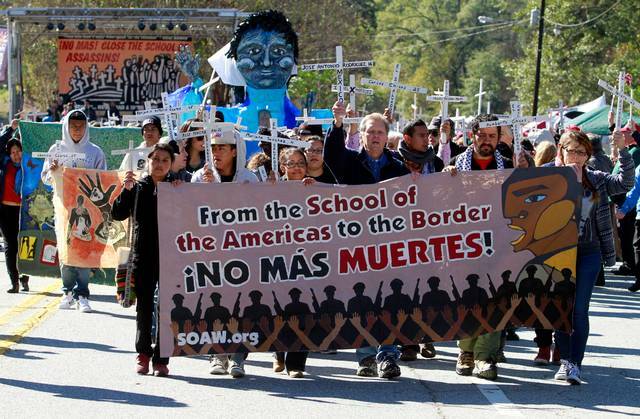 We, along with thousands of other activists, were advocating the closure of the School of the Americas which was the source of training for so many military soldiers involved in war crimes throughout Central America. The trip was notable for me for a number of reasons, primarily because I was in charge of driving a van load of college students to the demonstration. I unknowingly drove our van right onto this large military base with our demonstration posters proudly displayed in the windows. I did not know of my mistake until we were surrounded by military police and escorted to a large administrative building at the center of the base. We were told to step out of the van with our hands up and escorted to a prison type building where photos and finger prints where taken of us. All the while I was wondering how I was going to explain this to the administrators at Aquinas. After briefly interviewing all fifteen of us we were given very official letters instructing us not to return to Fort Benning for a period of 10 years. The experience reminded each of us that the practice of solidarity needs to involve some personal risk so that we can understand in a small way the oppression that so many go through on a daily basis in Central America by merely exercising their human rights. GRPH – Do you think your experience working in El Salvador was connected to the larger Central American Solidarity Movement? If so, how? When we lived in El Salvador and even when we would make occasional visits back to the states during that time of 1986-1992 we were quite conscious about staying on the periphery of the CA Solidarity Movement. Our main focus at the time was not getting kicked out of El Salvador. We knew our phones were tapped, we saw helicopters circle low over our house on a weekly basis and we saw the leaflets that military planes dropped throughout the city that said “if you see foreigners engaged in any suspicious activities please immediately inform the authorities.” We did not want to be kicked out of the country and have all the programs that were directly benefitting many of the poor in El Salvador shut down because political opinions. We were doing solidarity work behind the scenes and out of the media. I remember explicitly an interview with a WOODTV reporter during the November, 1989 FMLN offensive who asked us our opinion on who the “good guys and bad guys” of the war were. Although we had an opinion we chose not offer it to the reporter to for fear that it might jeopardize our returning to El Salvador at the time. This was emotionally frustrating for us at the time but we understood that we were taking a long-view of solidarity with the poor of El Salvador. We were happy that others were being more aggressively lending their voices in denouncing this cruel war and US involvement in it. In the end, when we permanently left El Salvador people would come up to us and thank us for “staying” through the toughest years to experience the war side by side our partners even after many others had fled the country. GRPH – How did this work impact your life? Bill – The issue of land rights, land ownership and land tenure and how this was played out as a contributing factor to the war in El Salvador and basically throughout Central America has stuck with me for the past 30 years. I eventually went back to school for my doctorate in order to do more research on how lack of land tenure can stifle the socio-economic development of poor communities. Inequitable land tenure is a lens through which I now view most cases of civil unrest throughout the world. El Salvador taught me this and my time there has both forever blessed and tainted my worldview. GRPH – Why is it important for people to know this history about the Central American Solidarity Movement? Bill – During the 1950’s, 60’s, 70’s and 80’s all of the wars in Central America were framed within the Cold War mentality. The United States was intent on keeping any hint of Soviet-style communism from having a foot-hole on the North American continent. Therefore, any type of insurrection, civil strife or rebellion against the governments in power was seen as a communist incursion. It did not matter that people were revolting against extreme oppression and injustice. We just did not want to see any hint of communism on our continent and saw it as something to be squelched at all costs. This was the line given to the American public and pretty much swallowed by most of them in a tone of mass hysteria and fear. That tone of hysteria and fear is very much alive and well today as Islamic terrorists are seen as the new threat to American way of life. In El Salvador the US was willing to sacrifice thousands of innocent lives in a proxy war in another land “so that” communism didn’t come to our door. Likewise, now, the US government is still willing to sacrifice innocent people in other lands “so that” terrorism doesn’t come to our door. Our proxy war of today is happening in Syria and Iraq at the expense of civilian lives because of our fear that ISIS fundamentalists will somehow take over our country. Another solidarity movement is required in light of today’s time and situation. To understand the present it is essential to know the history. There is no doubt in my mind that the present issues of immigration, powerful drug cartels and environmental degradation can be traced to the violence of the 1980’s in Central America. It is not hard to connect dots if we understand what was occurring and why it was happening and who was sponsoring it. This entry was posted in Central American Solidarity Movement and tagged CRISPAZ, FMLN, Grand Rapids Central American Solidarity Movement, solidarity with El Salvador, US policy towards Central America. Bookmark the permalink.